All the taste but healthier and easier to make! I have always adored anything sweet and sour and fondly recall the tasty but not-so-healthy meatballs my mom used to make with brown sugar, corn syrup AND sweetened pineapple juice in them, along with a generous portion of soya sauce for a salty kick. I wanted to come up with a recipe that provided a nice balance of flavours but knew I wanted it to be fast, with baked meatballs (SO much easier and less messy than frying). Oh, and a gluten-free option was key as well. This dish was a huge hit with my taste testers and I’ll be making it again often. It would be just as good with beef or pork meatballs, if you prefer. Feel free to add in more vegetables (sliced carrots and zucchini are great) and even pieces of fresh or frozen pineapple if you like. Preheat oven to 375F. Line a large baking sheet with parchment paper and set aside. Combine meat, 1 tablespoon cornstarch, 1 teaspoon soya sauce, Chinese five spice and beaten egg in a medium bowl. Use a small cookie dough scoop, two teaspoons or your clean hands to shape into one inch (2.5 cm) balls and place on prepared baking sheet. While meatballs are cooking, make sauce by placing ketchup, sweet chili sauce, honey, rice vinegar, soy sauce and 1/2 cup water in a large saucepan placed over medium heat. Whisk to blend well and heat until simmering. Whisk together the remaining 1/2 cup water and 2 tablespoons cornstarch; whisk this mixture into the simmering sauce and cook, whisking often, for 3 minutes. Add the chopped onions and green peppers plus the cooked meatballs to the sauce. Cover and heat, stirring gently a few times, until onions and peppers have softened (about 5 – 7 minutes). 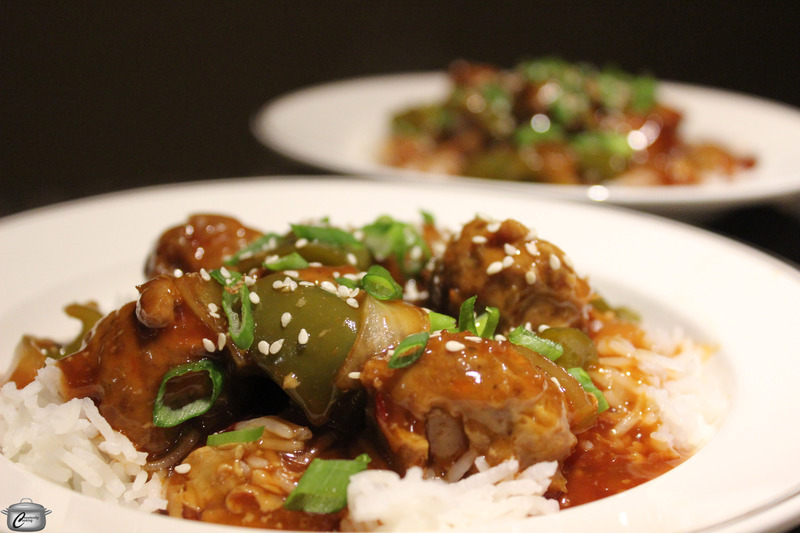 Serve meatballs and sauce over hot cooked rice, garnished with slivered green onions and sesame seeds. 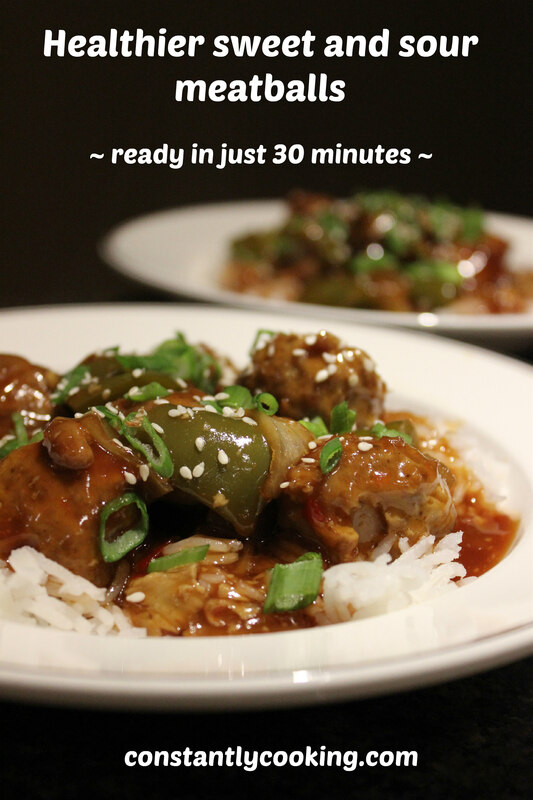 This entry was posted in dinner and tagged Asian food, chicken meatballs, chili sauce, dinner in 30 minutes, dinner in a hurry, gluten-free meatballs, healthier Asian dishes, meals that kids love, Paula Roy, sweet and sour, turkey meatballs, vegetables. Bookmark the permalink.